I recently helped my sister throw an amazing Harry Potter party for kids. She did all the hard work finding lots of Harry Potter birthday party food ideas to use at her daughter’s birthday party. A Harry Potter birthday party this magical deserves to be shared! We took lots of photos to help give you the best ideas for a Harry Potter party. For your convenience, we added links to click on directions and where to find Harry Potter party supplies, printables, and other things you may need to make your party happen. There is SO MUCH to tell you about this Harry Potter birthday party from the food to the decorations, party games and more. I decided to break it up into four separate blog posts because it was way too LONG! This blog post is all about Harry Potter birthday party food. I will update the end of this blog post with direct links to the other Harry Potter party idea posts as they get published here at Mom Always Finds Out. You can also go to the right sidebar to Subscribe to my blog’s newsletter and/or to follow me on social media so you don’t miss out. We served a variety of finger foods including fruits, vegetables, and junk food. My sister found printable Harry Potter themed food tent labels (for sale on Etsy.) I used a black Sharpie to hand letter them with the names of our party foods. Read on to see photos and directions for Harry Potter party food ideas: Gryffindor Grapes, Professor Sprout’s Veggie Garden, Broomsticks, Golden Snitches, Slytherin Snakes and Huffle Puffs. Gryffindor Grapes are simply grapes. Any color will do. Before serving, we washed the grapes and even did all the “hard work” of taking the grapes off the stems! Professor Sprout’s Veggie Garden is a pre-made vegetable tray purchased from the deli. We gave ourselves a break here after doing all that hard work on the Gryffindor Grapes. Huffle Puffs are cheese puffs. All you do here is open up the bag and pour them onto the plate. Slytherin Snakes are gummy worms. Another one of those “open bag, dump contents on to serving plate” easy peasy party foods. Golden Snitches are a gold Ferrero Rocher chocolate with paper wings. They are easy to make and look great grouped together on the serving table. Golden Snitches can also be used as party favors. We found various tutorials with free printable wings posted online. Search around and pick your favorite one. Ah, the Harry Potter Cheese Stick Broomsticks. Anything to do with a broom is going to be a chore, right? The good news is that I could have made a hundred of these and they would have all gotten eaten. The kids loved them! Each broomstick snack took me about a minute to make. I ended up enlisting two others people to help me make the Broomsticks out of white string cheese and pretzels sticks. Here’s How To Do It: We made the Broomsticks by cutting a white string cheese stick in half, then carefully peeling the strings about 3/4 of the way to the end to be the sweepers. On the unpeeled end of the cheese stick, we poked a thin pretzel stick into the middle about 1/4 of an inch to be the broom handle. For the birthday cake, we ordered cupcakes in four different icing colors to represent the Hogwarts House colors (red, yellow, blue, green.) 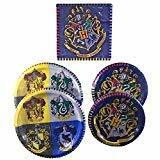 All we had to do was add one of these Harry Potter Hogwarts Houses cupcake topper rings to each cupcake. Done in about 60 seconds. For drinks, we served bottled water with printable “Butterbeer” bottle wrappers. We found free printable labels online and printed the labels at home, cut them out and taped one around each water bottle. Easy! We made our own tiered stands for serving food (Those craft directions are listed for you below.) We also used a mix of gold serving platters we already had on hand. These DIY tiered serving stands are easy on the budget if you’re willing to put in a little bit of time to make them. For each stand, you’ll need (3) dollar store plastic serving trays and (3) glass candlesticks. The dollar store trays are silver, so if you want to turn them gold, you’ll need Metallic Gold Spray Paint and strong glue. I like to use E6000 glue. Note: For food safety purposes, unwrapped foods should not come into direct contact with spray painted surfaces. Wrapped food is OK. Or, you can line the trays with paper before setting unwrapped food on them. Cupcakes in wrappers would be okay to set on the painted trays, too. If you want gold tiered stands without the do-it-yourself part, Amazon sells this set of (2) gold tiered serving trays that would look great serving your Harry Potter birthday party food. Don’t forget! You’ll need Harry Potter Party Supplies to serve your food. Take a look at a couple of party themed bundle options pictured below from Amazon. There’s a 16-guest Harry Potter tableware bundle which includes 16 Dinner Plates, 16 Dessert Plates, and 16 Luncheon Napkins. It’s perfect for any Harry Potter Themed Celebration. 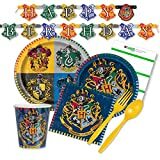 We paid a few more dollars for the second set, which includes includes all of the above Harry Potter themed paper plates and napkins, plus 16 paper cups, forks and spoons and a Happy Birthday banner. I hope that you enjoyed reading about all the different Harry Potter birthday party food ideas. If you have any questions, feel free to ask away in the comments below. Are you planning a Harry Potter party? Let me know your favorite Harry Potter birthday party food ideas in the comments below. Harry Potter Party Invitations includes free printable Hogwarts Acceptance Letter birthday party invitations, DIY Hand Lettered Party Signs and directions for How To Make Hedwig Balloons. Every kid is a Harry Potter fan. You can also add Polyjuice potion to this mix! It will make the party more interesting. This is so cute and creative. Thank you for sharing, Nicole! I’d come to your party!! I love Harry Potter!! Where did you find the food tags printed? I can’t wait to show my wife this so we can do this with our son and daughter when she is born (Expecting her here the 21st 😀 ). 21st is a good day! I’m having my birthday then, too. Congratulations! I think you all did a great job. Thanks, Ann! It was so much fun. I still have more ideas to post from that party, and just haven’t had the chance to get them all together yet. We are having a HP dance party and among many thing we will have a sign outside that says “follow the spiders. Then tiny spiders will lead the way inside, then on the wall, as they get bigger and bigger ending up with a huge Halloween yard spider half on the wall and half on the floor! Fun! Awesome Food Ideas…. My daughter is having her 10th birthday party On Sunday and you have saved me a ton of trouble with your fantastic ideas!! Very creative, love the ideas.